Everyone loves a good wedding and this week we got news of a biggie! Finally sections of the nation cry... 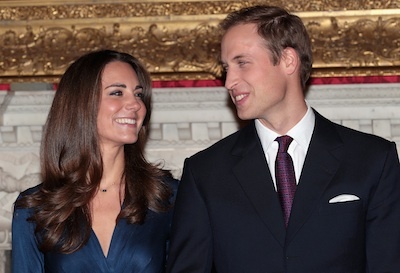 Prince William and Kate Middleton have announced their engagement and are planning to marry next year. The Bishop of Liverpool, the Rt Revd James Jones one of many of the Church’s leaders to congratulate the couple, said that “one of the first sources of tension” for an engaged couple was “the invitation list. . . Don’t imagine that the royal couple will be immune to this, however big the church they choose.” It may be a royal wedding, but it is just a wedding with all of the joy and stress that you would expect. Cynics are already queuing up to see an alternative benefit for the announcement. Lord Sugar, of The Apprentice fame, encouraged companies to use the announcement to bury bad news. it would seem, whether intended or not, that is what has happened. Because of the Royal announcement the story about former Guantanamo Bay prisoners receiving payments from the government (in return for dropping claims that British secret agents knew they were being tortured) struggled to be reported as did other stories including the loss of up to 3000 police jobs. Weddings are normally a source of good news and rejoicing. Ours certainly was. It was stressful to organise and if we did it all over again we might do parts of the day differently, but would we get married in the first place. I love Alex and I wanted nothing more to show her that by making public commitments before our families and friends and in the sight of God. Now whilst the detail of the wedding day begins to fade into the mists of history - nearly 10 years now - the fact that I am married is not in any doubt. How do I know that? I could show you our marriage certificate. certificate - my name is there, so’s Alex’s and it has been witnessed by our fathers’. How else could I and you be sure that I am married? Well, I have a memory of an event at a certain date, place and time with family and friends in a church and then a reception venue in Somerset. How else though can you be sure that you are married - I could reflect on nearly 10 years experience of married life with all it’s many highs and mercifully not so many lows. Today, on this Feast of Christ the King, we recollect a royal wedding, where earth is wedded to heaven and heaven wedded to earth; where Jesus, God’s appointed King of the universe marries His bride - us. For today we celebrate the completing of God’s work in Christ, offering the world a chance of a lasting relationship with Him and knowledge that all that holds us back from being the people He and we long for us to be - our guilt, our shame, our sin - are taken from us. This royal wedding isn’t a chance to bury bad news. It is the best news in the universe and is shared in joy every time we accept Christ’s kingship of our hearts and lives and of our world. How do I know that Christ is King in my life? Emily will be able to show you her baptism certificate. The day that she was committed to Christ. Her baptism in itself, doesn’t make her a Christian any more than being born in MacDonalds makes you a hamburger. For Christ to be King of her and our lives begins with an event - for some of us that will be our baptisms. For some of us it may be the day that we made a concious decision to discover more for ourselves. For my marriage to Alex to work though we need to continue to work at our relationship; spending time together. The same is true for Emily’s and our relationship with Jesus - spending time with him in prayer and worship and in reading the scriptures, and in spending time together, seeing her love for him grow and her ability to live and love like him to flourish. How do I know that Christ is King in my life? Emily will be able, with some help, to recall her baptism day and the people she shared it with - especially her parents and Godparents. For Christ to be King of her and our lives involves recalling not just today, but another event in history where earth was wedded to heaven at the foot of the cross of Christ. How the crucifixon of Jesus offers us a new opportunity of a relation of God is a theological debate we could have, but but that event some 2000 years ago changed the course of history for Emily and for you and me, for through it, we can know God for ourselves and invite Christ to direct and shape our lives and actions. To become what the Bible calls Christlike - not being a holy goodfornothing, but being more loving, joyful, peacefilled, more patient, more kind more good, more faithful in friendships and relationshps, more gentle spirited, and more self-controlled. Sound good? How do I know that Christ is King in my life? Emily will be able, with some help, to recall her baptism. But baptism is not the end of something, rather the beginning of it. For Christ to be King of her and our lives involves not just the events of today, but the actions of tomorrow. If we long to see our lives changed and transformed and to become the sort of people He and we long to be deep down, it will take Emily and each of us time to live each day the way that Christ would want us to. That is hard, but it is is the experience of Christ’s promise to be with us always, every day every where we are, which gives us the resources we need to try to follow Him, to live and act and speak like Him, to constantly be asking ourselves - what would Jesus do in this situation?